Slime Drop Drama is the fourth level of World 3 found in Yoshi's New Island. As the name suggests, Slime Drop appear in large quantities in the level. 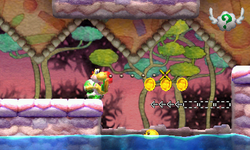 Yoshi starts the level in an area with an Egg Block and some enemies, along with some moving platforms that he will have to ride on in order to reach the next area. A Checkpoint Ring awaits, followed by some more moving platforms and spikes. Eventually, an upwards-moving platforms takes Yoshi to the boss door where Kamek awaits. As Yoshi is fighting Kamek, there will be floating balloons each carrying a missile. To beat Kamek, Yoshi will have to throw an egg on a balloon so that the missile lands on Kamek. After Kamek is hit three times, the player gains access to the next level. Metal Eggdozers are found in a subarea containing a Smiley Flower.